LoseBig (our WLC promotion website) is currently undergoing another round of improvements and feature enhancements. Currently, LoseBig is approved for registration and online payments. The reporting tools are currently experimental, but will be approved for general use within a couple of weeks. We’ll also have a new Facebook Application available for your participants to monitor their progress online through their facebook account. Facebook can be a great way for you to promote your next local WLC! In addition, we’ll be ‘internationalizing’ the site so HNN members who live outside of the USA can use this new service. Thanks for your support of HNN! Participants can also register using Facebook Connect which allows a Facebook user to register with their facebook account. There will be more Facebook tools coming soon. You first use your HNN account to sign in, then you create a new account for the new LoseBig service. Over the weekend, I’ll be posting some “how-tos” which will show you how to use this new service. Please don’t use for (real world) use yet. 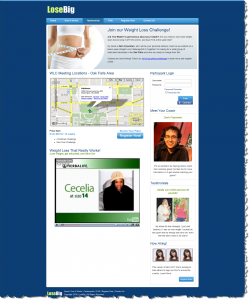 Streamlining Your Next Weight Loss Challenge! Our new local WLC website is currently completing it’s first round of testing. We’re adding new features, improving the site navigation and tools, and getting ready to bring in a new group of distributors to review the site. At first, LoseBig will be used primarily as a ‘landing page’ for your local WLC advertising, as well as online challenge registration and payment. After that, the next phase of development will be creating a series of reports for you to use for your challenges. Our overall goal for LoseBig is to create a resource that will be so useful to you as a distributor, that you will want to use it for your challenges even if none of your participants do! For example, the site will be able go generate attendance and statistic charts in PDF format that you will be able to print off and take with you to each challenge. Each week, you could record the participants weights on a form, then enter the data into the LoseBig website. Participants can then login and review their data, view graphs, and download the training PDFs from the site. At the conclusion of the challenge, you could generate a professionally formatted report with their statistics on it, along with graphs and other data. You could print these and hand them out to each participant (for those who don’t use the site), or your participants could log into their account and download it themselves, if they wish. We have a lot of questions for you as we complete the website, and your feedback is critical. If you could take a few minutes and review these questions, and then send us your answers we would greatly appreciate it. Also, if you have any templates for reports that you would be willing to share with us, that would be outstanding. What do you require at registration? Basic contact information, of course, but what other data would you like to gather? Would you like the participant to complete a ‘wellness questionnaire’? What a bout a ‘lifestyle questionnaire’ that could be used to determine products for your participant? Do you currently use anything like this? Do you take ‘before and after’ pictures of each participant? What information do you take to your first challenge? Challenge roster for attendance? Do you have a form you use for on-site enrollment? Do you use any checklist for each participant? What items are on this checklist? How do you currently track attendance? Do you use a form for this? What data do you record each week for your participants? Besides the spreadsheet available from Herbalife, what do you use to keep track of this? Do you take measurements? Which ones, and how often? Do you present your participants with a handout showing their final weight, total weight lost, or other data? If so, how do you create this? What follow-up information do you leave them with? What kind of follow-up do you do with your participants after the challenge? Finally, in what other ways do you see our new web service fitting in with your local WLC? Please contact us with your ideas and suggestions as soon as you can! We’re ready for some feedback on our new local WLC site. Here’s our first publicly released screenshot. A lot of things are still subject to change, but I think you’ll get the idea. We are currently planning on launching this site for use in January 2010. We’re following the same development model we used for the WorkFromHomeSystem.com website – put something basic online where distributors can try it, use it, and make ‘real-world’ suggestions for improvement. We then compile a list of suggestions and rework the site to implement your feedback. Other features?? It’s entirely up to you! These will be personalized with your own profile picture, local information and events. This will be included for FREE as part of your HNN account.